Kayaking / Sea Kayaking at Cardigan Bay Active01239 612133work KayakingSea Kayaking: We’re blessed with some of the most impressive coastline in the west. High cliffs, islands, caves and of course the resident dolphin pod makes our sea kayaking one of our firm favourite activities. Sea kayaking is available throughout the year, minimum age 8. A popular activity, that allows you to visit the world in which dolphins and seals have their fun. 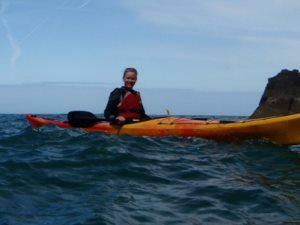 Sea kayaking in Pembrokeshire is one of the best ways to see Britain’s only coastal national park. Sea Kayaking is perhaps one of the oldest modes of transport that dates back 4000 years and was used to hunt everything from sea otters to whales. We are fortunate enough to be able to use these same methods to explore a breath taking environment. No two sea kayaking sessions are ever the same—wind, waves and tide are constantly changing the sea state so you’re always guaranteed a unique journey. Our qualified, local instructors will lead your group into areas of the coast which would be inaccessible any other way, giving you the opportunity to see spectacular geology and marine life in untouched habitats. A fun introduction to kayaking on flat and gently moving water in the Teifi gorge. For those who want to get on the river but want a more involved experience than canoeing, try our river kayak lessons. designed as a fun introduction to the sport of kayaking in a safe and suitable location, we have a small set of rapids which allows us to develop your skills on both moving and flat water kayaking. All the kayaks and equipment we use is top quality, as well as local qualified guides. As well as games designed to involve the whole group and develop your confidence in a kayak you have the opportunity to learn new skills. Basic boat control including forward, reverse and turning strokes, your qualified coach is on hand to develop and refine your paddling strokes. Also the fact we have rapids means we can introduce skills such as breaking in/out, edging and leaning, use of eddies and even rolling a kayak if you have prior experience or would like to hire a coach on a one to one basis. Minimum age 10 years old. We will supply all the equipment you need for your day on the river including boats relevant to your experience and the conditions. Sea Kayaking: We’re blessed with some of the most impressive coastline in the west. High cliffs, islands, caves and of course the resident dolphin pod makes our sea kayaking one of our firm favourite activities. Sea kayaking is available throughout the year, minimum age 8.